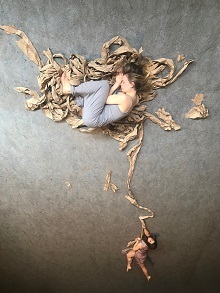 Thousand Beginnings is a piece of performance art that combines intensely physical choreography, philosophical poetry, and visually dazzling prop work into happenings about the expectations of femininity a woman needs to shed to find peace. It’s a substantive debut from Under The Umbrella and a challenging addition to the Toronto Fringe that will leave plenty to ponder after the curtain falls. The duo of Gulce Oral and Jewels Krauss play inhabitants of a limbo-like wasteland haunted by and forced to grapple with society’s opinions about how a woman should be. They process and respond to these opinions through their bodies, using grunts, yelling, and physicality to communicate what words can’t. They also use lots of unrolled paper towel, repurposing it into monstrous representations of the general public’s traditionally myopic views on womanhood. The towel is tentacled and menacing, but also comforting and inviting like expressionist art. As Gulce and Krauss proceed to reenact obstacles to mature womanhood, from inheriting a sense of inferiority from systemic sexism, to confusing acquiescence with politeness, to objectifying yourself to get what you want,they soon grow concerned for lack of progress. The Thousand Beginnings corresponding to the umpteen delays in self-realization they’ve endured as a by-product of inequality. Their yearning for structured, stable identity in a world that reminds them they aren’t good enough is the fuel of revolutions. They are fiery vessels for the history of discrimination against women, slowly poking at its ideological inconsistencies until it begins to unravel and unlock their self-confidence. Thousand Beginnings unites social justice and current events with high concept art in a show that speaks to its time and the understanding that improving it is a never ending endeavor. Photo of Gulce Oral and Jewels Krauss by Lucas Olscamp.